How to Sell at JBF! & days later, you get a check e-mailed to you! Make money on your kids items! Consignors earn an average of over $300 at each sale! Consignors earn 60% on their consigned items minus a $10 consignor fee. They get to shop early before the public. If you sign up to help at the sale you earn 70% on your consigned items and shop even earlier. No time to tag? Check out our Valet Tagging option below. Volunteer Sign Ups, coming soon! Check your day planners and get a sitter! WE NEED YOU! Just log in to your JBF Profile and click "Help at the Sale" to see the available volunteer shifts. Shopping early is the best way to find the best deals...which Presale Pass do you want? The more you volunteer, the earlier you shop! Earn 70% and Shop first! 10-15 hour volunteers get to shop the 1/2 price presale, Saturday 6:30-7:30pm. PLEASE NOTE: FOR THE SAFETY OF ALL, CHILDREN ARE NOT ALLOWED AT PRESALES (UNTIL 7:00pm AND AFTER) OR DURING YOUR SHIFT TIMES. 2. Check in at the computer & receive your pre-sale pass. 3. Have all clothing inspected. 4. You put your items on sales floor. Toys, Room Decor, Shoes & Books can be dropped off at our "drop zones". If you are bringing large items, we can not always guarantee that someone will be able to assist you with unloading. If possible, please plan on bringing your own "muscle" for these items. To participate in the second drop off you must have already filled out all of the drop off paperwork at the first drop off. 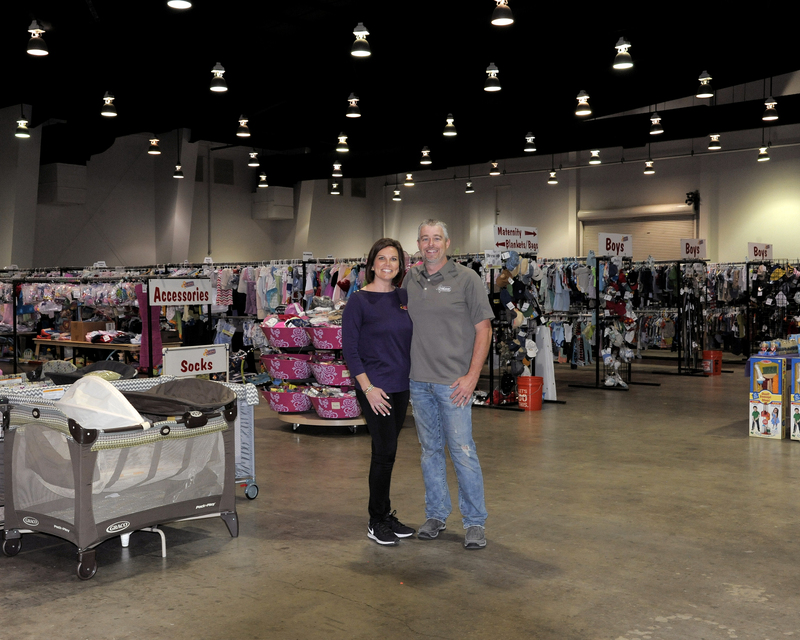 We will only accept items that DO NOT have to be inspected so, no clothing items, shoes, car seats or cribs. When you arrive you will check in at the entrance and place your items on the selling floor. 1. Check out at computer. 2. Locate your consignor number on the racks. 3. Make sure all clothing items belong to you. 4. 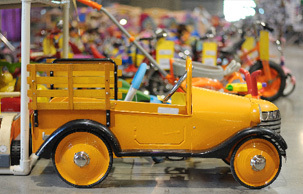 Find your toys, shoes, books on tables with your consignor number range. Check the middle of the floor for the bigger items that won't fit on the tables. 5. Look in designated "missing tags" area for items that belong to you. 6. Take all your items with you and proceed to the exit line. Items not picked up by 7pm will be donated to Buckner Children's Home. The donation truck will be loaded at this time and no entrance will be given to anyone who is late. We must vacate the building at our scheduled time, and it is not possible for us to take items not picked up home with us. 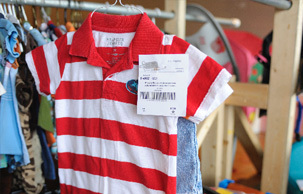 We accept sizes newborn - 18 clothing for girls and boys, and shoes size 0 and up. There is no limit on how many clothing/shoe items you bring. We also accept Junior items up to size 5 (sizes 0,1,3,5). Limit 10 current junior items per consignor. Due to rack space we can not accept larger junior sizes. Please do not bring adult sized clothing, we do not have room on the racks & are a "children's sale." ALL clothing items must be on hangers (including: sleepers and onesies). You set your own price on all items. Price to sell! *you can use our pricing guide link (found in the circle, scroll down). Generally items sell for 1/3 of the original price, depending on name brand and condition. Better brand names, unique items, or high price items usually bring more money and sell better. Please use $.25 price increments only (i.e. ; $6.00, $6.25, $6.50 rather than $6.99). An average price for shirts is $3-$7 and an average price for shorts/pants is $4-$8.You set your own price on all items. Ask yourself "what would I pay for this item?" Our best advice is to price your items 1/2 to 1/4 of the original retail price. See our pricing guide below for more information. Price your items to sell so they won't be coming back into your house. Hanging Instructions: To prevent items from falling off the hangers, please use appropriate sized hangers (or extra safety pins to attach the clothing to the hanger), child size hangers for the infant sized clothing and adult size hangers for toddler size up. If it slips off the hanger please reinforce it! Small zip ties are great for holding items on the hanger. * All garments should be hung with the hanger hook pointing left (hanger should resemble a question mark when looking at the front of the item). * Safety pin clothing sets securely with pants hung on the backside of the shirt so both pieces can be viewed without unpinning them. * Safety pin through BOTH pieces AND through the hanger (this will prevent pants from weighing down the shirt and causing a possible tear). * Please safety pin pants to the top part of the hanger so the garment will not slide (zip ties also work great). • Small parts should be bagged and taped to the main part very securely. Use HEAVY packing tape. If parts get separated, it will not sell. • Games and puzzles should have all pieces and be taped closed. • PLEASE do not use packing tape on books or puzzle pieces, it will tear the paper when taken off. Use painters tape. • Several small items can be grouped together in Ziploc bags (books, rattles, grab bags for small toys). • We will ONLY accept stuffed animals that are LIKE NEW! No other stuffed animals will be accepted. • Again, you MUST secure Ziploc bags with packing tape so that pieces do not get lost! MATERNITY ITEMS: limit of 10 items per consignor. • Must be in excellent condition. Please do not bring out-dated maternity clothes. They will not sell. • Please secure the tops with safety pins if they have a tendency to fall off the hanger. • Breastfeeding tops are accepted with maternity clothing. • Other Maternity Items: belly bands, pregnancy books, etc. sell very well. • Infant equipment includes: Car seats, strollers, high chairs, swings, exersaucers, bouncy seats, boppies, play gyms, pack and plays and bassinets. • Car seats cannot be older than 5 years old and must have the owner’s manual (you can print this online). • Large toys and outdoor play equipment must be clean, free of dirt and or water. Mr. Clean Magic Erasers work well on these items. Must include all pieces. Name brands sell well. See the Safety & Recalls link below. • Please be aware of our goal....to be the BEST in the consignment business. All shoes must go through shoe inspection. • Shoes with dirt or mud will not be accepted. • Must be tied in pairs by shoelaces or put the shoes in a clear baggie. Laces and shoes must be in excellent condition. Zip Ties are great to keep shoes together! • Attach a tag with a large safety pin to the laces or tape the tag on the bottom of the shoes or the bag. • For shoes with no laces, put them together in a Ziploc bag with the tag taped to the outside of the bag. Tape the bag closed with heavy packing tape. Fall/Winter Sale: Clothing and Shoes for cool weather is accepted at this sale including: sweaters, Halloween costumes, coats, Christmas dresses and we will accept uniform shorts and short sleeved shirts. Spring/Summer Sale: Clothing and Shoes for warm weather is accepted at this sale including: shorts, swimsuits, sundresses and jeans. No long sleeves (except light sweaters for Easter). Flip flops are accepted if there are NO scuffs or stains. * ANYTHING that has to do with raising a newborn to a pre-teen! Loose Items: Like bibs, cloth diapers, bottles, small toys, bows, socks, etc. must be in clear Ziploc bags with the tag attached to the outside of the bag. Use clear packing tape for securing the bags closed. This prevents 'little' hands from reaching in. Blankets and Snuglis sell better if they are hung over a pant hanger. Be sure to put a safety pin on them so they don't fall off the hanger. Do you have stuff to get rid of but no time to tag? Being a Valet Consignor is for you! We will do all the work for you! Sign up ASAP! Limited spots are available. Click on the link for information about the program and to sign up. Bring your clean, sorted clothes/toys/items to the Valet tagger. The Valet tagger prepares & tags your items. Take them to the sale and put them on the sales floor or purchase your tagging supplies for you. You will still be given a pre-sale pass to attend the consignor pre-sale on Wednesday. Enjoy your clean closets and drawers and cash your consignor check! Following these simples hanging tips will help your items sell better! The hanger hook should point to the left like a question mark when looking at it. We take any type of hanger: plastic or wire are both fine. Hanging pants: attach the pants with safety pins on each side and one through the middle of the waist band and to the TOP part of the hanger to ensure that pant will not slide. Hanging sets: Most sets can be placed on one hanger. Safety pin thru both clothing pieces AND around the top of hanger (this will prevent pants from weighing down the shirt and causing a possible tear). Remember: Clothing is sold on hangers, so hangers will not be returned to consignor. Unsold clothing will be returned on hangers. Tag Gun: If you are interested in ordering a tag gun, you can find great deals on ebay. Remember to be very careful when using a tag gun and tag through the size tag or inside lip in the neck area, since we will not accept clothing with holes. Safety pins: Please use 1" or larger safety pins: NO straight pins or small gold safety pins. You make BIG bucks when you are ready to sell these popular items! These are our best sellers! Kids grow and change so quickly, who can keep up. With 3 kids, we are always looking for ways to save money, this is where JBF comes in. You can sale the items that your children have outgrown or toys they don't play with anymore, then you shop to replace those items. It's a win-win for all. We hope you enjoy your JBF experience. Please let us know if we can help in anyway.